Instructions for operating and installing an Instant Access IPS security cabinet. Before installation, remove unit packaging. Peel back canvas on left side of art frame to reveal keyed lock. Using key provided with unit, open the cavity between art and safe door which should allow you to see printed circuit board and wiring. 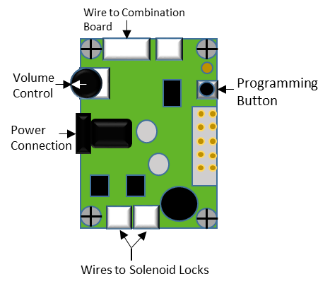 Locate small round programming button on circuit board and push to set code. Enter your desired code into the four button strip on top of art frame. The second, third and fourth buttons are used for the actual code and the fourth button (or pinkie finger button) is an enter button. Using index, middle, and ring fingers, input desired combination (3-8 numbers in length, numbers are repeatable). Press enter. Your pass code should now be set, but input the code and press enter again to test the unit before installation. When properly programmed, the security cabinet will unlock when the correct code is inputted and the enter button is pressed. Close the printed circuit board cavity and lock the frame to the safe door. You are now ready for installation. To begin, select preferred location for art. Use stud finder to determine location of studs in wall. Mark inner edge of studs on wall using a pencil. Measure from inner edge to inner edge to assure that the width is at least 14.5“. Determine your vertical placement of the painting on the wall and mark 3/4” below top edge of preferred placement. Measure 34 1/8” down from this mark and make another mark. Using a level, square, or straight-edge measuring device, extend placement marks to complete outline of safe. Using a razor knife, cut along markings to create proper size wall cavity. Remove dry wall cut out. Open safe door and insert safe into wall cut out. Make sure to check inside of wall for any potential obstacles such as wiring, insulation, etc. prior to insertion of safe. Allow base of safe to rest on bottom of cut out. Make sure safe is flush in the wall by checking that top and bottom tabs of the safe are flat against outside of wall. Using a drill, drill screws into the six pre-drilled holes on inner sides of safe. Check to make sure each screw is fully tightened and safe is secure in wall.